Remove excess fat from beef. Cut beef into 1-inch pieces. Sprinkle beef with salt and pepper. In 10-inch skillet, heat oil over medium-high heat. Cook beef in oil about 5 minutes, stirring occasionally, until brown. 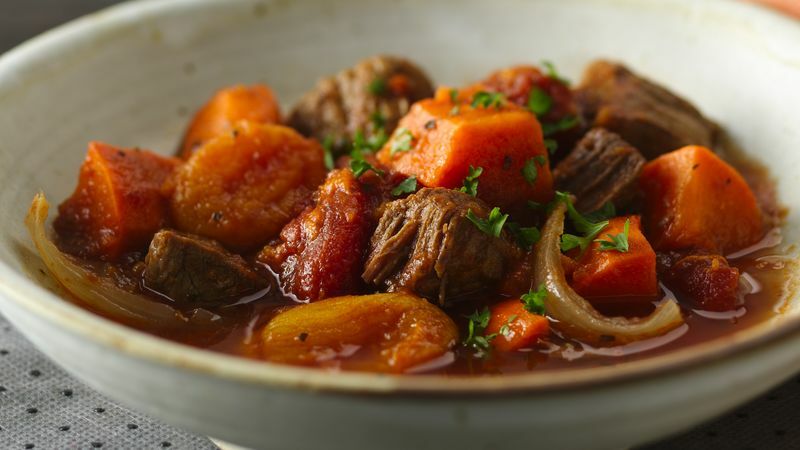 In 4- to 5-quart slow cooker, mix beef and remaining ingredients except apricots and parsley. Cover; cook on Low heat setting 6 to 8 hours or until beef is tender. Stir in apricots. Cover; cook on Low heat setting about 15 minutes or until apricots are softened. Discard cloves, bay leaf and cinnamon stick. Sprinkle stew with parsley. Purchase already cut-up beef stew meat instead of the boneless beef chuck. Enjoy this chunky Colombian-inspired stew over cooked couscous.